The Four Corners potato may be small—no bigger than a copper penny—but this starchy, edible tuber is mighty, having survived in the wild landscapes of southern Utah for nearly 11,000 years. Packed with proteins and vitamins, it was a powerful source of nourishment for the American Indians living in the state’s Escalante and Bears Ears regions, say University of Utah researchers. Centuries later, Mormon pioneers consumed the wild potato, and—even later—some of their descendants survived on it during the Great Depression. On Monday, the timeline for the Four Corners potato extends into the 21st century as modern-day diners in Utah will get to sample, for the first time, this piece of ancient history during the second annual Indigenous Dinner at the Natural History Museum of Utah. Reclaiming ancestral foods is the theme of this year’s event, sponsored by Utah Diné Bikéyah and part of Indigenous Peoples' Day, a counter to Columbus Day. Karlos Baca, food activist and founder of Taste of Native Cuisine, an indigenous food cooperative based in southwestern Colorado, will prepare a four-course dinner made with wild, foraged ingredients native to the Southwest. The tentative menu will include Anasazi bean soup, a grilled cactus salad and smoked river trout with the Four Corners potato, wild berries and wild onions. Proceeds from the $125-a-plate dinner will go to Utah Diné Bikéyah, specifically its traditional foods program, which is working to incorporate indigenous foods, like the Four Corners potato, into American Indian diets as a way to improve health. It’s part of a larger indigenous foods movement taking hold across the country. After rediscovering these tubers in several small isolated areas near Bears Ears National Monument and Escalante—as well as other spots in the Four Corners region—U of U researchers collected samples, brought them to the greenhouses at Red Butte Garden and have been propagating them in 3-gallon pots. Last week, they harvested about 8 pounds of potatoes that Baca will use for Monday’s dinner. It’s a tale that likely will have a few more chapters. Pavlik and research partner Lisbeth Louderback, the Natural History Museum of Utah’s archaeology curator, learned recently that they had received at two-year, $95,000 specialty food crop grant through the Utah Department of Agriculture and Food and U.S. Department of Agriculture. Pavlik said the money will be used to study and compare the taste and nutritional values of the tubers from various Utah sites to determine which one has the best taste and is most productive for cultivating on a larger scale. For Cynthia Wilson, a Navajo and the director of Utah Diné Bikéyah’s traditional foods program, the Four Corners potato represents far more than a way to make money. “Repatriating the potato,” she said, “is a way to capture our relationship with food and the spiritual elements of how food is grown, gathered, hunted and shared through our communities." That deep connection to food and the Earth is something that was lost decades ago when American Indians were forced onto reservations, she said. Their diets, which once followed the seasons and were based on hunting, fishing, gathering and gardening, were replaced by government-supplied commodities. Decades later, a diet of fry bread and Navajo tacos — ones her ancestors would never recognize — has resulted in higher rates of obesity, diabetes, heart disease and high blood pressure than the general population. Wilson, who holds a master’s degree in nutrition from the U., pointed to “many different types of indigenous food at Bears Ears that we want to revitalize — from pinions and juniper ash to deer and elk." The Four Corners potato is unique. The potatoes most people are familiar with descended from tubers native to South America and bred into thousands of varieties. By contrast, the species found by the U. researchers is native to North America and limited mostly to parts of Arizona and New Mexico. On the Colorado Plateau, it is found in small, isolated populations. The tuber is highly nutritious, packed with twice the protein, zinc and manganese, and three times the calcium and iron, of the South American variety. Last year, Pavlik and Louderback released their archaeological research that shows prehistoric inhabitants of the Escalante Valley could have been nourishing themselves with this tuber for thousands of years, long before potatoes were known to have been domesticated into one of world’s most widespread and vital crops. During the course of the U. research, the scientists discovered these populations are closely associated with archaeological sites. This suggests ancient peoples brought the potatoes here and planted them. 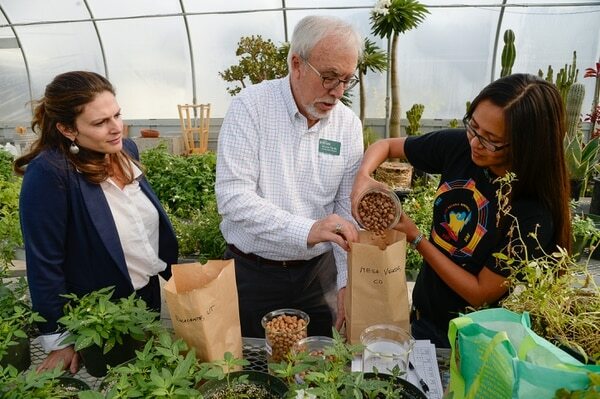 U of U scientists discovered the tubers being grown in a family garden in Escalante by a 94-year-old descendant of Mormon pioneers who settled the valley in 1876. By then, the area already was known as Potato Valley, according to the journals of U.S. Cavalry men who passed through a decade earlier and ate the wild potatoes. Behavior one might expect from an ancient superfood.